A mathematical corollary of the exactness property of a total differential is that its integral z2 - zi from state 1 to state 2 [i.e., for the process from (xi,yi) to (x2,y2)] is independent of the path (or constraint) y = F(x). For example, if x and y denote p and T, the path could be a combination of an isothermal step and an isobaric step. Or, x and y could vary in a continuous fashion as shown by the curve y = F(x) on the x - y plane in Fig. 6.1. 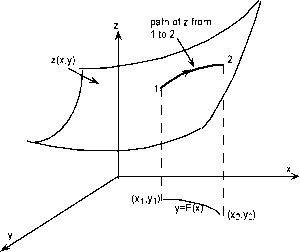 This curve generates a corresponding path on the z(x,y) surface, as shown in the diagram. If the total differential is exact, Eq (6.4) is satisfied and Eq (6.5) gives the same value of z2 - z1 for all paths F(x). Problem 6.1 provides a purely mathematical exercise to help understand the distinction between exact and inexact differentials. 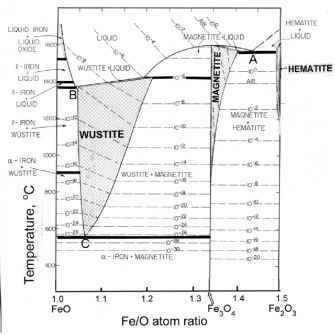 The relevance of the above mathematical prelude to thermodynamic calculations stems from the independence of thermodynamic property changes on the path of a process. This characteristic implies that all thermodynamic functions must satisfy Eq (6.4), whether M and N are partial derivatives of particular properties (as in Eq (6.2)) or, more generally, when they are any functions of thermodynamic properties.